Amid rumors that the Philippines might lose the hosting rights of the 2019 Southeast Asian Games slated in the second half of the year, Philippines Southeast Asian Games Organizing Committee (PHISGOC) Chairman Alan Peter Cayetano vowed that the country will remain the hosts of the biennial meet. “We will continue to host the SEA Games. There is no truth to reports of the contrary,” Cayetano said, as per Mike Murillo of BusinessWorld. Philippine South East Asian Games Organizing Committee (PHISGOC) Chair Alan Peter Cayetano welcomed Ajinomoto to the SEA games Family of Sponsors as the first consumer food brand in the Platinum category. 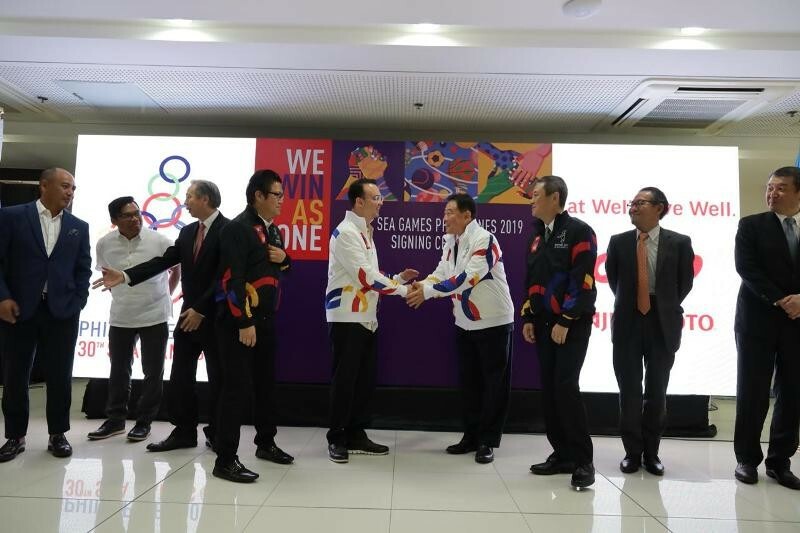 He thanked all its officials for their enthusiasm in supporting the 30th SEA games and Para games to be held starting this November 30, 2019. The statement came after stories circulated online about the Philippines’ hosting rights being under scrutiny due to the construction of venues and internal politics. Neighboring countries like Indonesia, which hosted last year’s Asian Games, and Thailand are also reportedly ready to “step up” in case the SEA Games need a replacement host. But Cayetano reiterated that the “SEA Games fever” should already be felt come June or July. “We want to focus on the training of our athletes,” Cayetano said, also mentioning that the mid-term elections in the country slated for May 2019 are still one of the priorities of the government. “Construction of major structures for the event is on track. And when we say on track we mean by September they will be ready, or two months before the hosting so our athletes can use them for training. Of course, there are delays in construction but these are normal and we were assured that they will be completed on schedule,” the former Secretary of Foreign Affairs added. Most events in the 2019 SEA Games shall be held at the new sports complex under construction as part of the New Clark City project. Some events will also be held across Metro Manila and Mega Manila.